Smithfield, NC: Mr. Thomas “Tom” Oscar Barbour, age 87, of 250 NC Hwy 210, died Friday at Meadowview Assisted Living in Smithfield. Funeral services will be at 3:00PM Sunday at the Rose & Graham Funeral Home Chapel, Four Oaks. Officiating will be Revs. Joseph Hester and Al Warrick. Burial will follow in Hills of the Neuse Memory Gardens, Smithfield. Mr. Barbour was born in Johnston County on September 15, 1930 to Willis Oscar and Lena Lee Barbour. Mr. Barbour was preceded in death by his wife, Joyce F. Barbour, and several brothers and sisters. 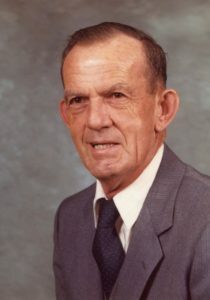 Mr. Barbour was owner and operator of Barbour’s Concrete Works and worked for Arnold Wilbert in Goldsboro for many years. He was a member of Smithfield First Presbyterian Church. Surviving are his daughter, Teresa Calton of Clayton; son, Ricky Barbour of Four Oaks; five grandchildren and twelve great-grandchildren. The family will receive friends from 1:30PM to 2:30PM prior to the service at Rose & Graham Funeral Home in Four Oaks. In lieu of flowers, donations may be sent to Smithfield First Presbyterian Church, 215 S. Third St., Smithfield, NC 27577 to the attention of Beth Daniel. Arrangements by Rose & Graham Funeral Home in Four Oaks.